Photo dump Maisto Hauler Combos. Just some 2016 Hotwheels . Some quick photos to share. Well a just few pictures shot through my Instagram acc yours in small diecast Dave H NZ. Thought my small collection of Solido vintages deserved a group shot for your approval. Dave H NZ. Found this new hot wheels 5 pack which I haven’t seen listed anywhere yet while on a road trip called flashfire. 3 More 1/43 Solido Vintages. Went to the monthly swap meet boot sale that we have here mainly household junk clothing etc though of late I have managed to score some diecast from some stall holders. More Hot wheels 20 pack exclusives. Just a couple of exclusive colours from some 20 packs I have obtained in the last few months I think one set was 2015 and the other a 2014 though it is hard to tell, as some of the castings colours look a few years old. More Hot wheels Racing Pro Stocks. Hot wheels Racing Chevy Pro Stocks. Lastly the usual Buttshot Yours in Drag small diecast Dave H NZ. Another item from Small Scale Sydney’s care package just love them Mopars. Some more Dragstrip Demons for 13. Gangreen Camaro and Hot wheels Mustang. Greenlight thanks to Small Scale Sydney. Greenlight Motor World American Edition 1969 Chevrolet Camaro series 11. Arrived in box of goodies from Small Scale Sydney. 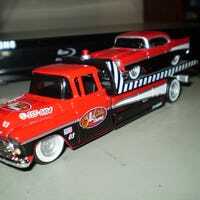 Yours in small diecast Dave H NZ. Just testing with sorry about the quality yours Dave H NZ. Still around but relying on phone to post replys yours Dave H NZ. Just some of my Maisto Pairs I have a lot more some I have up to 4 colour variations.